This week Kenny and his team have created a tasteful Food Recipes Layout Pack. With its eight different layouts, you can create all the needed pages to achieve a beautiful and effective food recipes website. 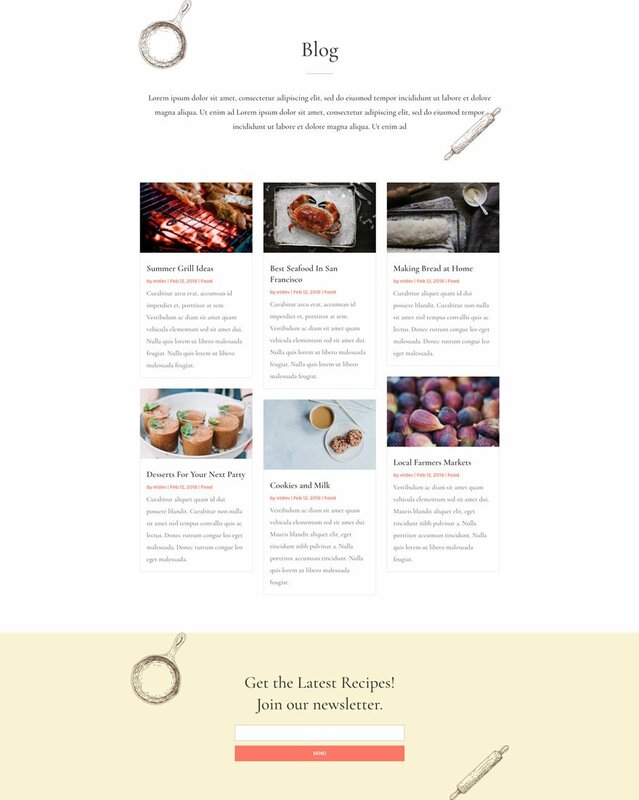 One of the included layouts is the recipe layout which you can reuse and adjust to every recipe you share on your website, leaving you with just one thing to do: changing the specific details for each one of those new recipes. This food recipes layout pack allows you to focus on what’s really important which is the tasty recipes you’ve worked on so passionately. The different layouts that come with this layout pack fulfill every communication need you have. 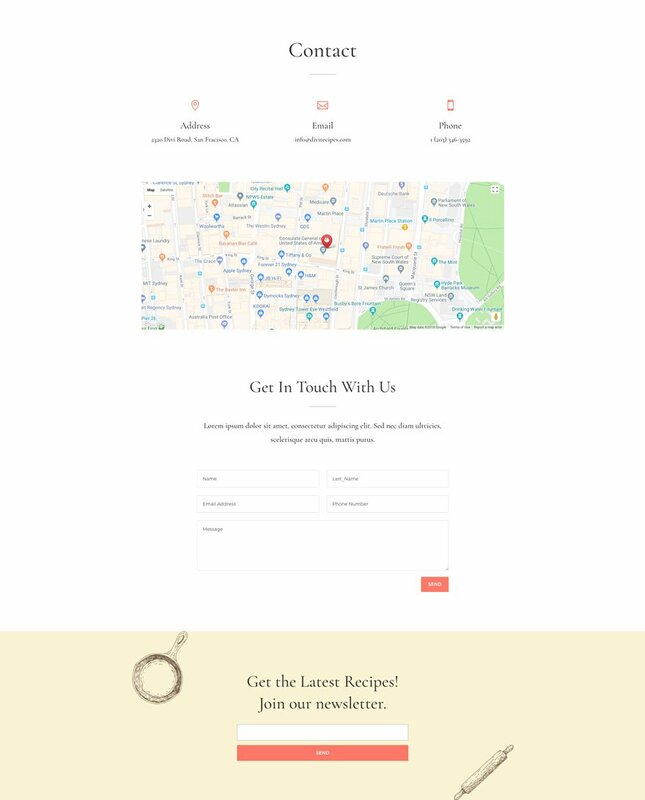 The recipe page sets your creativity free by providing you with all the elements you need to present your recipes elegantly and effectively. You can reuse the recipe layout for every new recipe that comes out. The only thing you’ll need to do is change the steps, media and copy according to your new recipe. And with the Visual Builder close within reach, this will take you almost no time. To access your new layout, simply activate the Visual Builder when editing a page and look for the “Load From Library” icon in the page settings bar (it looks like a plus symbol). Click this icon to launch the Load From Library popup. Under the Premade Layouts tab, you can easily find the new layout by scrolling through the list of layout packs. Once you find the Food Recipes Layout Pack, click on it. You will see all the individual layouts included in the pack. Select the layout you want for to use and then click the “Use This Layout” button. We hope you enjoy this food recipes layout pack. And to help ensure that you do, we’ll be doing a live stream on our Facebook page this Tuesday at 3pm EST to walk through how to add a mega menu for categories and recipes to your overall recipes page. The image download link doesn’t work. worked for me first try. Worked for me first try also. Thanks Donjete! Looks like the link has been repaired and working now. Needs an extra set of graphics we could use for blurbs. Can we get the cyber monday and other free layouts into the Divi library? I agree with John. The link is not correct. How about specific business/agency layouts instead of generic agency layouts? What about layouts for landscapers? This is a beautiful layout. I have a question. Is it possible to incorporate one or two pages from this design into my already created website, instead of using the entire design? For example, my site has a section for recipes and this would work beautifully, but I don’t want to completely change the design of my entire site because we cover more than just recipes. Thank you! Yes, you can create a new page and load the specific layout you want to that page. You can l’import/ incorporate any of the pages from the demo site from the load from library panel when you first create a page. All the design and layouts are there on the first tab of the panel. And here is an extra tip. If you just want to use part of a layout, load the layout into a spare page and use the Save to Library control on the section, row or module you want to use elsewhere. On the page where you want to use the element you saved to library, click on the + that appears when you hover on the bottom part of sections, rows and modules and then select the tab that displays your library item. I think I understand but I’m not a web developer. So when I add the premade layout to a page, it will upload everything? Or can I pick which page I want to add? Then what you’re saying is if there is just one section on one of the pages I might want to use elsewhere, I can save that section to my library and add it to another page? Same here… The resource link is not working. Thanks. This is an amazing layout, good job. it’s been fixed now. sorry about that. Great layout packs, thanks for all your hard work! Can I please put in a request for a security layout pack? Aimed at security guarding and public protection with country neutral images. Thanks! Wheres the links to the layout? It doesn’t appear in my Divi library neither when I use visual builder and follow the instructions as above. I don’t see any layouts other than those I have added myself. Am I doing it wrong? Tony, you might have to clear your browser cache or update Divi. It’s a feature that was added over the past couple of months, so that might be it. And if you haven’t cleared the browser cache in a while, it might just be pulling an older version of the builder up, and that will flush it all and get it up to speed (literally, with another update we made, haha!). I just updated my divi theme, and there they are! all premade layouts, how wonderfull! Now!, there is no excuse to make a really nice website! I’m also experiencing trouble accessing this layout pack. As always, many thanks for your dedication and value! You all are incredible! People, they are in your premade layouts now. You do not have to download, but do have to be a member. Never mind, already addressed, was some sort of delay. You can delete these 2 comments moderator. 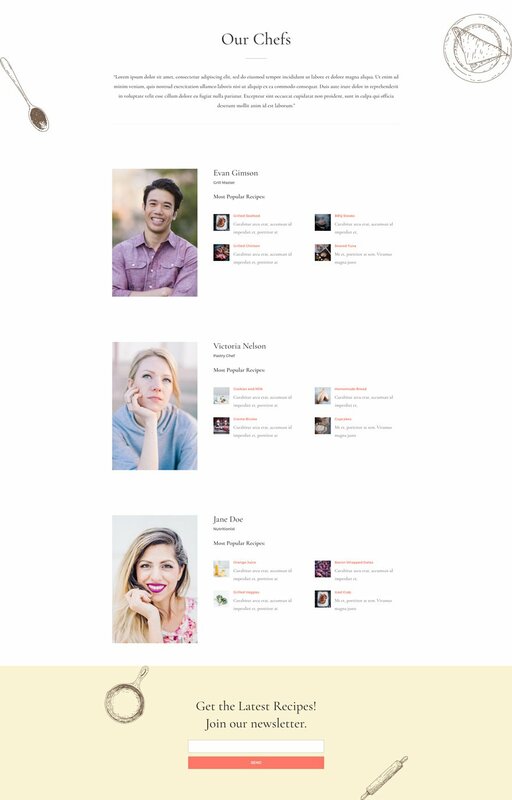 sorry i love divi, your photos is great but your free design layout…. I know it’s impossible to please everybody. Not taking anything away from the ones who create the layouts. I’d like to see more diversity. Seems the last several layouts have either been similar or on the same niche. I see several have commented the same. I got to the layouts in the library, but I can’t see the recipes layout for a single recipe? Very nice, clean layout. Great job, guys! What kind of solution do we have to insert “my” facebook (pages. personal posts, instagram feed (mainly) ect… as a blog feed for “blog” section? thanks for your enlightenments. if the subject has been treated, could you post the link? Thanks for all these layouts but my humble question when are you releasing Church layout(s)?? We’ve got one in the works. Not sure about timeline though. Thanks Nathan we will wait patiently. Looks great. Does it work with Extra? This is a great layout pack but I can’t import the recipe layout. Every other layout in the pack works but that one. Can you let me know the issue? Each design has its own audience. I think this is a mediocre design. Opening a recipe post for editing takes 20-45 seconds, or saving /adding. Anyone experiencing similar performance issues?